Ahem Ahem, Hello World! This is OMGAyush Productions again with Addon/Module for his ultra successful patch “EA Sports Cricket 2012” . This module adds the IPL Fixtures, Kits, Stadiums, Matches and all the IPL 5 experience in your Cricket 2012 Patch provided by OMGAyush Productions! Amazing right? Play cricket at your homes! • Includes Direct Download Magnet Link Torrents! • And more surprises awaiting! Just read the “READ_ME” File provided with the download. All the steps are explained. Before you download, make sure that you have the requirements! 7. Select User Team & Start playing DLF Indian Premier League 2012 with Actual Fixtures. After Downloading the both above links..
Just right click on any downloaded file and click on extract…..
Run the setup file “IPL-V.exe” and install it to your Cricket 2007 Root directory. 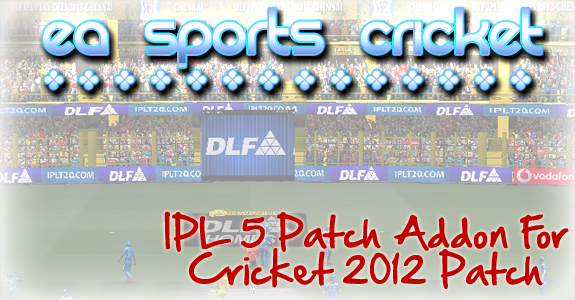 Below Screenshots are Game-Play Reviews/Actions of DLF IPL 2012 Patch! Please Seed For Other Downloaders! Enjoy the Game and Let them enjoy download! Enjoy Playing the DLF IPL-2012 for EA Cricket 2007 PC Game & Cricket 2012 Patch. Your feedback will be appreciation for us. Its space is too small 42 MB something and too good,i like it. why is ipl5 showing english county teams? Also I am not able to play bbl. The moment i select team and continue it simulates automatically and shows an english county team winning the state season. Also IPL showed a fixture Mumbai Indian vs Glamorgan. And Australian state season is corrupted. The game crashes. This is best game I’ve ever played because of small size it is downloading fast and I’ve not downloaded zax-batpack . But still it works well.from my side 5 star keep making more Games. But one problem I’am playing without loading rosters . But when I load the roster and when game starts it shows a “ async load error ” please help me ! If u can’t no problem I can play without rosters . Hey Navneet, I’m sorry for the late response. With all the new patches we’ve been making (recently IPL 7 Patch) – I’m not getting the time to check out the previous patches. Well, I’m definitely sure if you follow the steps correctly – you can play the game error free. Make sure you install the ZAX256 BatPack – without that you will keep getting errors. If you download and install that, you can enjoy your game with realistic names and bats, and error-free. A big thanks to you . Finalllly I got my IPL??? ?